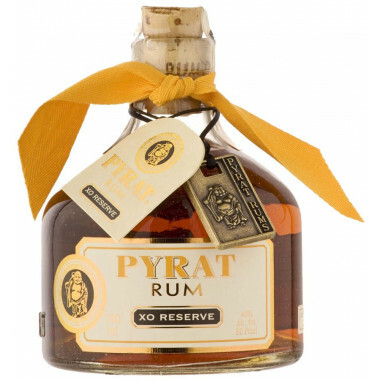 Pyrat is a dark rum with amber highlights, resulting from a blend of 9 Caribbean rums aged up to 15 years in French and American oak casks. Pyrat is a dark rum with amber highlights, resulting from a blend of 9 Caribbean rums aged up to 15 years in French and American oak casks. The recipe has been devised by the creators of Patron tequilas. The bottle design reminds of the rum bottles famous amongst pirates of the 1800's. Quite fragrant, this rum is a rich bouquet of cane sugar, candied orange, toffee, caramel, marzipan and intense orange flavours, with spicy vanilla hints. Attractive, with honeyed notes of bittersweet orange, candied apricot, exotic fruits, caramel, cinnamon, spices, flowers and vanilla. A lingering spicy ginger zing and cinnamon finish. Each bottle of Pyrat rum bears the "Hoti" monk medallion. Hoti is the patron saint and zen protector of all barmen and fortune-tellers. Often represented with a broad smile and belly, the Hoti monk stands for happiness, appetite and generosity. Intense and round dark rum, with delicious notes of orange, honey and spices.